The Dr. Kildare TV show was a drama series on NBC that ran for 60 minutes for the first four seasons and then 30 minutes in its final season. It was about an intern (Dr. Kildare) at Blair General Hospital. The storylines were about how he learned to be a good Doctor plus his relationships and dealings with his patients and co-workers. The Dr. Kildare TV show was inspired by nine hugely successful films starring Lew Ayres as Dr. Kildare and Lionel Barrymore as Dr. Gillespie. Titles and air dates are listed near the bottom of this page. Between the movies and the TV show, there was also a Doctor Kildare radio show that starred Lew Ayres as Dr. Kildare and Lionel Barrymore (Drew's Great Uncle) as Dr. Gillespie and aired from February 1, 1950 through August 3, 1951! 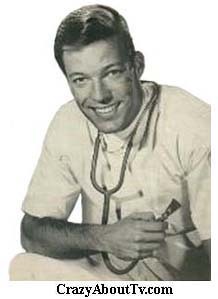 Thank you for visiting our Dr. Kildare TV show page!